Are creative people unusually sensitive? Clinical and research reports confirm that is often true – as well as comments by many creative people about their own experience. 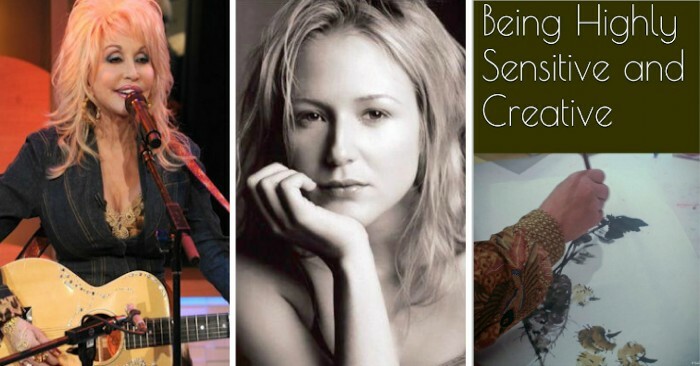 “Throughout my practice, I have encountered a connection between highly sensitive people and their own creative impulses. “This characteristic does not discriminate between painter, actor, or musician—they all appear to have one thing in common: they experience the world differently than the average individual. 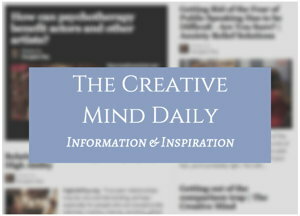 From her guest post: Highly Sensitive Personality and Creativity. Of course, being creative is not limited to people identified as artists, or just those who are pursuing creative ventures. Both creativity and being sensitive are on a spectrum – a range of different levels. 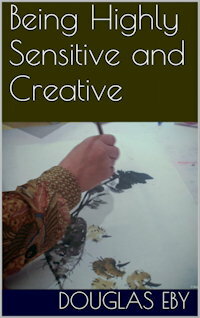 And simply being highly sensitive does not mean you are necessarily actively creative or an artist – though Elaine Aron declares all of us HSPs are creative (whether engaging in creative expression or not). from her debut album Pieces of You. “The truly creative mind in any field is no more than this: A human creature born abnormally, inhumanly sensitive. 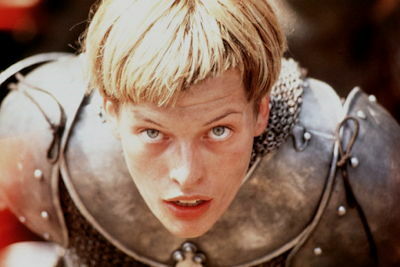 “To them… a touch is a blow, a sound is a noise, a misfortune is a tragedy, a joy is an ecstasy, a friend is a lover, a lover is a god, and failure is death. Her novel The Good Earth won a Pulitzer Prize, and in 1938 she won the Nobel Prize in literature. Pearl Buck’s statement, even if today it sounds overblown, is something you may relate to if you experience high sensitivity, and a compelling need to create – although I don’t agree with her idea the trait is “abnormal” or “inhuman” – see more below. Psychologist Elaine Aron, PhD is probably the leading expert on high sensitivity, or more technically, sensory processing sensitivity. Her research has found it is an innate personality trait present in 15 to 20 percent of us. It is not the same as introversion or shyness, though there are interactions and overlaps, as I note in my post Shyness, Introversion, Sensitivity – What’s the Difference? From her book The Highly Sensitive Child. Her newer book is The Undervalued Self. Back to Pearl Buck‘s famous quote above: “The truly creative mind in any field is no more than this: A human creature born abnormally, inhumanly sensitive” etc. While I appreciate her perspectives, there are parts I don’t agree with: What does “truly creative” even mean, and is she implying that only those who are highly sensitive qualify as “true” creators? Also, she says “inhumanly sensitive” as though it were some extreme condition – but research by psychologist Elaine Aron, PhD and others indicates the trait occurs with 15 – 20 % of people. In an edition of her Comfort Zone newsletter, Dr. Aron writes that Buck “was saying all creative people are highly sensitive. I don’t know about that, but I know ALL HSPs are creative, by definition. As a sensitive person, it isn’t up to others – it’s up to you to learn your needs and limits, and take care of not getting overwhelmed, so you can really embrace your sensitive trait and use it creatively. This connection continues to be confirmed by many people’s personal experience. One aspect of high sensitivity can be having strong feelings and emotions. – another aspect of being highly sensitive. Here is a summary of one research study. The study in the September  issue of the Journal of Personality and Social Psychology says the brains of creative people appear to be more open to incoming stimuli from the surrounding environment. Other people’s brains might shut out this same information through a process called “latent inhibition” – defined as an animal’s unconscious capacity to ignore stimuli that experience has shown are irrelevant to its needs. Through psychological testing, the researchers showed that creative individuals are much more likely to have low levels of latent inhibition. “This means that creative individuals remain in contact with the extra information constantly streaming in from the environment,” says co-author and University of Toronto psychology professor Jordan Peterson. Of course, the statement “might predispose to mental illness” does not mean we are more likely to be “crazy” if we are sensitive. But sensitivity can be emotionally challenging, stressful, and possibly an issue in our mental health. “About 15 to 20 percent of the population have this trait. “It means you are aware of subtleties in your surroundings, a great advantage in many situations. An HSP herself, Aron reassures other Highly Sensitive People that they are quite normal, and that their trait is not a flaw or a syndrome, nor is it a reason to brag. It is an asset they can learn to use and protect. Quotes are from summary of book The Highly Sensitive Person on her site The Highly Sensitive Person. Dr. Aron’s excellent site includes a wide range of information, and a self-test. “This trait is not something new I discovered — it has been mislabeled as shyness (not an inherited trait), introversion (30% of HSPs are actually extraverts), inhibitedness, fearfulness, and the like. “HSPs can be these, but none of these are the fundamental trait they have inherited. The reason for these negative misnomers and general lack of research on the subject is that in this culture being tough and outgoing is the preferred or ideal personality — not high sensitivity. This common reaction from other people – “Don’t be so sensitive” – is something a lot of us have experienced in life at different ages, and it probably has had an enduring impact on how we accept ourselves and think about being sensitive. Especially as a creative person, you need to follow your own path, your own mind and heart, and be authentic – not conform to other’s ideas of acceptable personality traits. Introversion and shyness, as Aron notes, may not inherently be part of the trait of sensitivity, but in my personal experience, and reading of many quotes by sensitive people, introversion and other qualities such as emotional intensity often accompany being sensitive. “How do you ever explain the feelings of anxiety and paralysing fear? I can’t answer those questions. Winona Ryder’s comment bring up the issue of anxiety. “HSPs are more affected by having troubled childhoods — such a past can, for example, make them anxious, depressed, insecure, or shy as adults. “This has nothing to do with the trait itself — HSPs with good-enough childhoods do not have these troubles. Nor are the problems unchangeable. They can be vastly improved by your attitude and by your HSP’s inner work, especially in skilled psychotherapy (sometimes along with medications). Anxiety has often been part of my life, so perhaps I am more aware of it and concerned about its impacts, but I think it is often connected with sensitivity, especially for creative people who are generally more willing than others to access their emotions. If it is part of your life, it is worth the effort to deal with it, because anxiety can keep you from more fully expressing your creative talents. My Talent Development Resources series of sites has a number of articles on anxiety, plus a site: Anxiety Relief Solutions. High sensitivity may be related to a number of “excitabilities” described in research on gifted children and adults, particularly by psychologist/psychiatrist Kazimierz Dabrowski. These personal “channels of information flow” and modes of experiencing can impact how gifted and creative individuals reach higher levels of development. But even for non-gifted people, these “excitabilities” may be relevant. Sensitive Living Coach Jenna Avery writes about self-care and embracing our sensitivity to thrive in her article Are You Highly Sensitive? “Learning to thrive as a Highly Sensitive Soul presents challenges. If you’re sensitive, you have likely accumulated years of training in trying overcome the trait because you don’t “fit in” with society. “And yet being Highly Sensitive is a vital part of you. A first step toward thriving as a Sensitive Soul is to understand and accept your trait. “Hear this now: There is absolutely nothing wrong with you. You are just different. As one of my clients says, being Highly Sensitive is both a gift and a responsibility. See her site for other posts, and for her online classes and other resources: jennaavery.com. 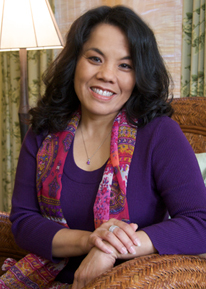 Another coach who specializes in helping HSPs is Ane Axford, MS, LMFT, a marriage and family therapist. She writes, “Understanding high sensitivity helps to understand that there is nothing wrong with you or HSPs in your life. This allows you to start focusing on living in a way that fits instead of trying to make your self fit. From her site: Sensitive and Thriving. See more reviews, information and purchase links (for three versions: Kindle, interactive ebook, and enhanced PDF) at the bottom of this page. Note: photos and videos are not included in the Kindle version. Douglas Eby, M.A./Psychology, is a writer, researcher and online publisher on the psychology of creative expression and personal growth. Kindle version – $3.00 – You can read the first part of the book free at Amazon.com. 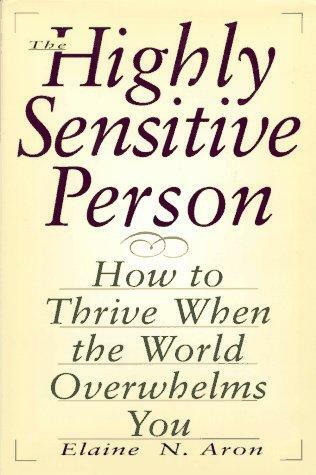 By Rosemary Judge — This book explains what the “regular” individual sees as quirks in the sensitive being. The sensitive human animal is given information on a level that is easily applied (recognized) and provides validation for behavior viewed as “unusual or odd” by others. The sensitivity of creative genius progresses from being “open” to receiving unlimited input within the sensory system, psyche, and physical presence of the so-called “nervous” individual. Thank you, most sincerely, for the personal enlightenment. By Cat Robson — The author draws on many different sources, both experts and artists, that I find both comforting and strengthening. If you’re new to this area it’s a great introduction and source of insight. HSPs and creative people will find good info and links. By Lou-san — We’re all sensitive to a certain degree. Some more than others. If we accept and enjoy who we are, life can be good. That’s what this book is all about. Excellent! 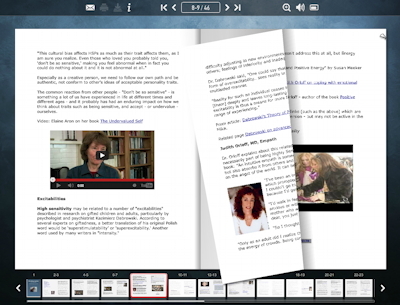 Viewing on a computer (above is a screenshot), you can easily navigate around the book by clicking thumbnail images, or “turning” the pages using a mouse, and you can play videos within the same window. On a mobile device (smart phone, iPad or other tablet), you can navigate from page to page by swiping with your finger. You can also play videos. To purchase, you must sign in using Facebook or Twitter (or set up a free account) with the publisher Joomag – which has multiple interactive ebooks and magazines available; many are free. Follow the link to view the first few pages free, and try out the interactive features such as page turning and zooming.